Hardcover, 9.75 x 13 in. / 176 pgs / 140 color. Following his sweeping exploration of landscape in 2012 at the Royal Academy of Arts, London, published in the phe­nomenally successful David Hockney: A Bigger Picture, this new volume looks exclusively at a new series of portraits that David Hockney, one of the most famous artists in the world, has been painting recently. In 2012, Hockney returned to California, where he had lived and worked for long periods. There followed a series of painted portraits, the subjects of which ranged from studio assistants and office staff to family, friends, and long-term acquaintances. Also included are a number of fellow artists, curators, and gallerists, including John Baldessari and Larry Gagosian. Reproduced in stunning colorplates the paintings are shown alongside revealing images of the works in various stages of development, which provide an exciting insight into Hockney’s painterly process. The book is introduced with two important new texts. 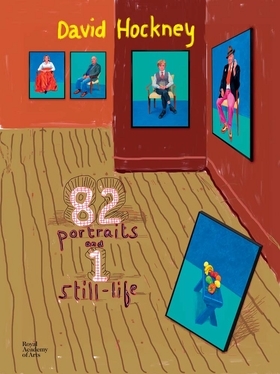 This vivid series of portraits, executed in bold acrylics, observant and full of life, marks Hockney’s vibrant return to Technicolor form. FORMAT: Hbk, 9.75 x 13 in. / 176 pgs / 140 color.